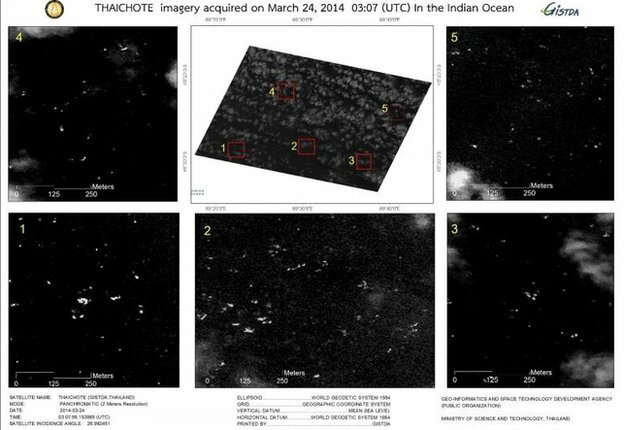 These images from Thai satellite Thaichote were thought to indicate possible debris from MH370. The public has received a crash course in how to interpret such images (Credits: Ministry of Science and Technology, Thailand). The disappearance of Malaysia Airlines flight MH370 has become one of the most infamous events in the history of civil aviation. The response from the international community is also probably the most wide-scale search ever attempted, and has involved the use of technical means (such as Doppler shifting on Inmarsat telemetry) never seen before in such an investigation. One result of this was a surprisingly explicit dissection of technical and engineering problems in the mass media. Channels that sometimes squirm at anything resembling hard science suddenly had no problems in throwing boffins from all sorts of disciplines on the air, and grilling them well. At one stage, one news channel had as many as eight “talking heads” simultaneously on-screen at the same time! In the earliest stages of the investigation, there was much reliance on optical satellite data to search for floating debris from the presumably ditched aircraft. Satellite imagery from China, Japan, France, Thailand and Australian-tasked imagery from commercial US satellites has all been publicly used in the search. It is also possible that other nations or agencies quietly carried out their own private searches using more covert space assets, but failed to find anything. The satellites failed to find any real debris from the aircraft, but images of possible debris soon flooded the media. Thus began a hard and rapid course in understanding satellite imagery for the mass media, and the mass audiences who watch them. High-resolution satellite imagery has been commercially accessible since 1999, when the first commercial 1-meter resolution satellite was launched by a private US company. Suddenly, a technical means that had once been the exclusive domain of intelligence agencies was widely available, with some understandable restrictions on some clients and targets. It was anticipated that all sorts of groups would come forward to use this new tool, including the media. For a time, the media eagerly printed some of the early, free images from these sharp-eyed birds, including the village constructed for the Sydney Olympics in 2000. It was hoped that the media would eventually make the transition from tasting free samples to becoming paying customers. That didn’t happen. Tasking and interpreting satellite imagery is a highly specialized skill. Journalists and editors aren’t trained for it. Furthermore, ordering satellite images usually costs money. For today’s media, that’s an even bigger problem than the skills barrier. So the media didn’t truly embrace satellite imagery, and they didn’t really develop any understanding of the processes involved. Satellite imagery still appeared sporadically in the media, but it had to be “spoonfed” to them. This usually happened when a think-tank or other organization would task the imagery for an investigation, perform their own analysis, then release a nice pre-digested summary to the world. Often the images themselves would not even appear for licensing reasons, but at least descriptions and conclusions would be printed. The media still didn’t pay for anything, and it didn’t really have to think too much. That was all done by other people. Some readers may consider this lazy, but “spoonfeeding” is how the media is increasingly getting much of its material on more Earthly topics. 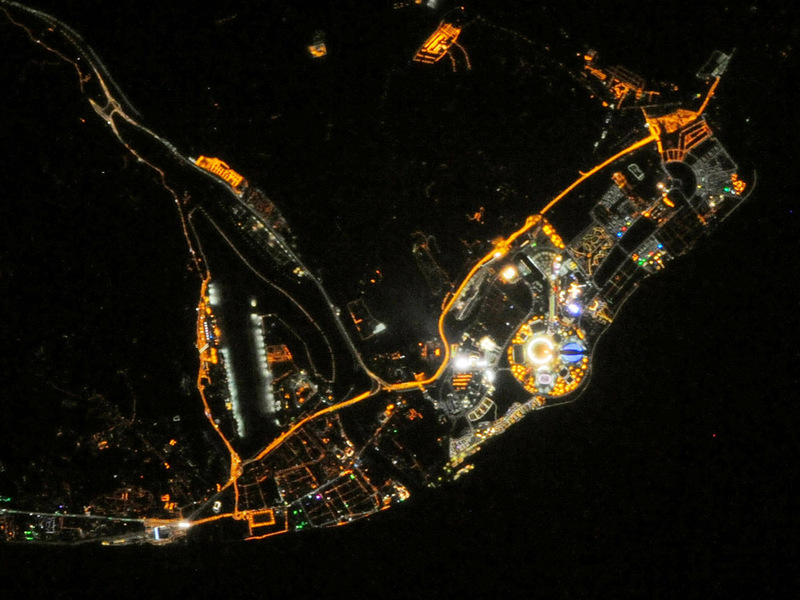 Mainstream media have been slow to embrace satellite imagery unless it’s of highly recognizable features, such as this photograph taken from the International Space Station of the Sochi Olympics (Credits: NASA). The satellite revolution had been with us for roughly a decade and a half when MH370 burst into the headlines. Despite this, the media were largely innocent when China started publishing the first images released in the search. Why had it taken days for this to be released? Was China being uncooperative? Such questions were both ignorant and unfair. In time, similar issues would be raised concerning the response of the Australian government and its own handling of satellite imagery. Again, the ignorance was disappointing. It has taken time, hard experience, and some underserved mudslinging at government agencies around the world to resolve this. But gradually, the media is slowly learning how complex it is to use satellites for search operations. They have learned this gradually by running analysts and engineers into studios and onto telephone links to describe the processes and the performance of the nations involved in the search. They have learned that it takes time to “task” at satellite to take images, time for it to move into position, time to downlink the images, and time to process the images once they are retrieved. All things considered, the performance of the satellite analysts and agencies around the world has been nothing short of remarkable. Instead of looking at known, fixed locations (like military bases or nuclear sites) the satellites have been tasked to scan huge tracts of ocean, littered with flotsam and jetsam. Instead of withholding or delaying information, the satellite intelligence community seems to have spared nothing in its efforts to release useful information as quickly as possible. It seems clear that some imagery has been “degraded” to hide its true resolution, but the analysis has not been compromised. 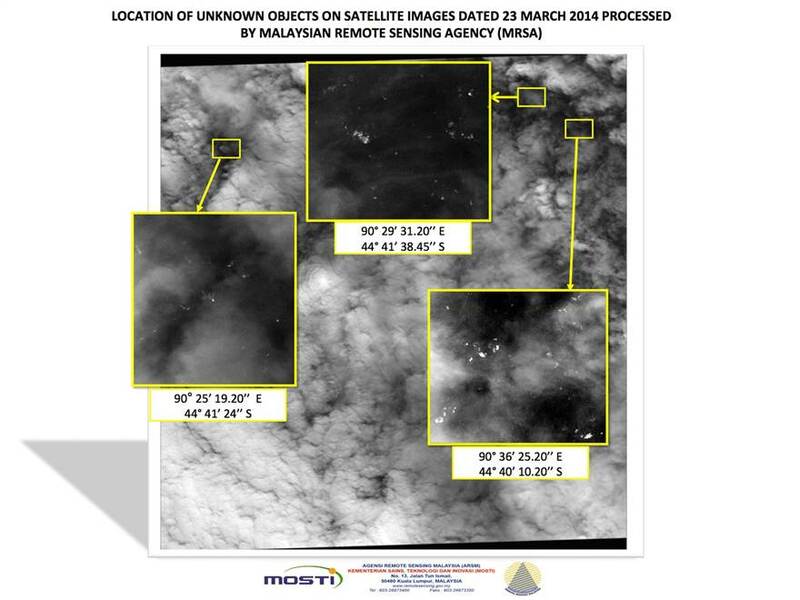 Satellite imagery of suspected MH370 debris from March 23, released by the Malaysian Remote Sensing Agency (Credits: Ministry of Transport Malaysia). The media were slow to understand satellite imagery, but this doesn’t fully explain the sometimes obnoxious theories that were raised in this search. The media loves sensationalism and controversy, and the MH370 saga was rich in mysteries. With suspicions running high, anything connected with the story was open for scrutiny. There is also the mystique surrounding modern technology. We live in a world where communications is ubiquitous, and surveillance is so precise that it is now a matter of public concern. Losing a huge jet aircraft laden with electronics seemed hard to believe. Then we have the popular image of satellites sold to us by Hollywood, where individuals are tracked on the street from orbit. Never mind the reality. The media now knows that tasking satellite images takes time, as does the interpretation. They also understand that not even the most talented analysts can be totally sure of what they are seeing. Some of the misconceptions of all-seeing, all-powerful eyes in the sky have been debunked. Hopefully, the media will take the lessons it has learned through covering this tragedy on board, and will be better prepared for the next time satellites are focused on a major story.